New York - More than 40 distinguished philosophers and theologians from 16 countries have joined the condemnation of Iran's policy to bar young Baha'is and others from higher education. 43 distinguished philosophers and theologians have signed an open letter protesting against Iran's persecution of Baha'i educators and students. 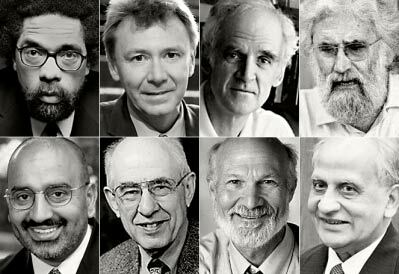 Among them are such prominent figures as: (top row, left to right) Cornel West, Princeton, U.S.A.; Graham Ward, Oxford, U.K.; Charles Taylor, McGill, Canada; Leonardo Boff, Rio de Janeiro, Brazil; (bottom row, left to right) Ebrahim Moosa, Duke, U.S.A.; Hilary Putnam, Harvard, U.S.A.; Stanley Hauerwas, Duke, U.S.A.; and Tahir Mahmood, former member, Law Commission, India. In an unprecedented global initiative, the 43 prominent academics - of Christian, Hindu, Jewish, and Muslim backgrounds - have signed an open letter, published today in The Daily Telegraph (UK), and reported in the Folha de Sao Paulo (Brazil). The letter condemns in particular recent attacks by the Iranian authorities on an informal educational initiative of the Baha'i community - known as the Baha'i Institute for Higher Education (BIHE) - in which Baha'i professors, debarred by the Iranian government from practicing their professions, voluntarily offer their services to teach young community members who are banned from higher education. Seven Baha'is associated with BIHE recently made their first court appearances after being imprisoned for four months. They were detained after a series of raids on 22 May, in which 39 homes associated with BIHE were targeted. The Institute's activities have since been declared "illegal." "As philosophers, theologians, and scholars of religion, living throughout the world, we are raising our voices in protest against the recent attack by Iranian authorities on the Baha'i Institute for Higher Education," the open letter states. "To acquire knowledge and learning is the sacred and legal right of all; indeed, the state is obliged to provide it. In Iran, the government has done the opposite..."
"Attacks such as these, against the rights of citizens to organize and be educated in freedom, can no longer be tolerated. We call upon the Iranian government not only to cease its persecution of Baha'is, but to provide, and promote, education for all." Among the most celebrated academics backing the call is Dr. Charles Taylor, Emeritus Professor of Philosophy at McGill University, Canada. He signed the letter, he said, out of his deep sense of "conviction that there ought to be 'no compulsion' in religion." It is also "connected to my disquiet about the Iranian revolution," said Professor Taylor, "and the way its finer ideals have been hijacked by people who are abusing their faith in order to make it serve as a tool of mobilization against the 'enemy.'" "Ever since the American and French revolutions at the end of the eighteenth century, the aspiration of peoples of different ethnicities, nationalities, and creeds for their fundamental human rights, including the right to worship as one's conscience dictates and the right to education, have gained momentum," said Professor Putnam. "The persecution of the Baha'i university students in Iran is a shameful attempt to turn the clock back to the dark ages. Their cause deserves the support of enlightened and moral people everywhere," he said.